It is simply not possible to write a full trip report for our trip to Europa Park today. The short version? We managed to ride some twenty five separate rides in under nine hours, a statistic practically unheard of in a park like this one on a weekend. This figure includes at least one go on each major attraction, and several laps on each coaster. Instead of attempting a blow by blow report, I'll just list off a few highlights. Atlantis Adventure was the only major new attraction since my last visit, it being a target shooting dark ride with the same basic mechanism as the Astro Blasters rides in the Disney parks. As one might expect from Europa Park this ride was definitely one of the better ones, with some excellent animatronics. The only thing I didn't like about it was the scoring system. A number of red coloured targets were scattered throughout the ride, and these were worth silly amount of points relative to all the others. Hitting the first one in my car abruptly increased my score by thirty thousand points, a little bit silly when most of the targets are worth two hundred times less than that. Silver Star was running very well indeed. 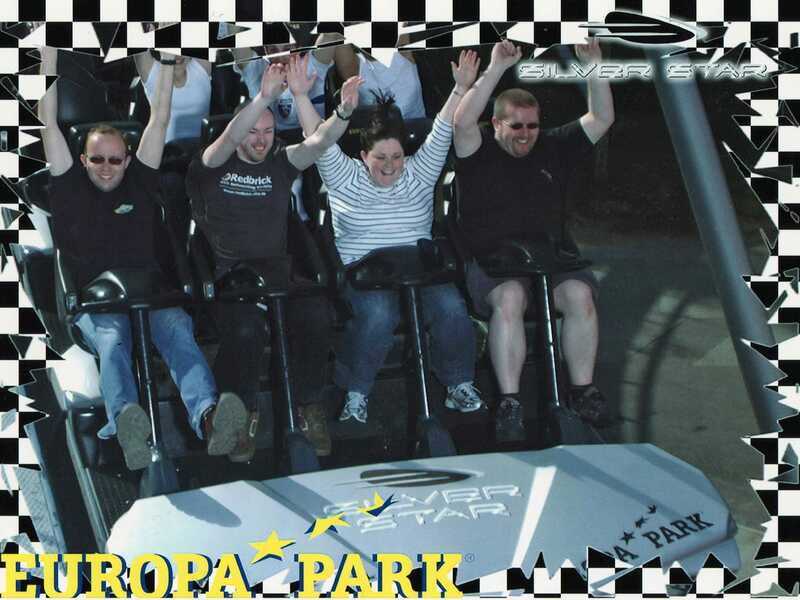 There was a decent amount of airtime in any seat, particularly towards the back. Better yet, the vibration experienced in the past was completely absent. It's always great fun to do a coaster like this one with non-enthusiasts, not least due to the facial expressions (and unprintable commentary) generated towards the apex of the lift hill. However, as the picture above shows, they found their nerves in short order! One high point of the day was courtesy of a local citizen manning the water cannons on the Fjord-Rafting ride. This reprobate managed a direct hit to my head, leaving me dripping wet on disembarkation. This was naturally sidesplitting funny to everyone else on board, particularly Ann who'd bought herself a poncho for the occasion. If I'd have known about the cannon I'd have bought one too!